We now have our first actual photographic image of a black hole, those theoretical entities first posited in a rudimentary way by John Michell back in 1784, with corpuscles of light falling back like tiny droplets. The properties of these strange cosmological objects were outlined more accurately in light of Einstein’s Theory of Relativity (1915), which, in line with its principle of matter-energy equivalence, proved that light – now seen primarily as a wave – could indeed ‘bend’ under the influence of gravity. Around the same time, Karl Schwartzchild is credited with the first full theory of a point of matter packed so dense – close to infinitely so – that not even light waves can escape the pull of its immense gravity. Hence, black holes are so named because they are invisible to an outside observer, except for a ring of light around the ‘event horizon’, the point of no return beyond which anything falling in can never get back out, entering a region where space and time are warped in ways we cannot (yet?) imagine. See what happens to Matthew McConaughey when he falls into one in Interstellar, about the same place his career went. What would really happen to you, great minds theorize, is spaghettification – yes, that is a real term – with the gravity on your toes being so much greater than the gravity on your upper body that you would be stretched out like a long noodle. Not recommended. 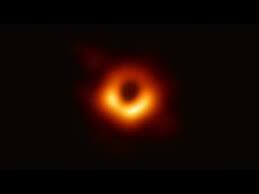 But worry not, for the black hole here pictured is 15 million light years away – untold trillions of miles, and its faint light from that distance gathered together over years from many layered images of hundreds of telescopes, making the wonderful composite photograph just released. It is also billions of times more massive than our own Sun, with all of that mass compressed into an infinitesimal point. We know not how many black holes there be, but be glad they are nowhere near our Solar system. For now, they wander far, far away, gobbling up what matter – planets, asteroids, moons – that dare cross their path, becoming ever-more massive, dense and powerful as they do so. In God’s good providence, black holes must serve a purpose, perhaps as roving inter-stellar vacuum cleaners, tidying up the excess. The universe is a strange and wonderful place, which should inspire awe in us humans, whirling around our own star, the Sun, as it whirls around our own galaxy taking all of us in its 43,000 miles-per-hour wake, the Sun in turn whirling around we-know-not-what, perhaps another super-massive black hole. So Sun and moon, stars and nebulae, praise the Lord, and give glory to His holy name, Who orders all things well. Speaking of black holes, the Ontario budget is being released today under the fiscal leadership of Doug Ford. Our province is currently over $348 billion dollars in debt – yes, more than a third of a trillion – and climbing fast, with billions of dollars in deficit – that is shortfall – every year. There are any number of ‘black holes’ sucking up all that money and resources, not least the vast swathe of generously recompensed ‘public servants’, and not just those still working, but all those who are being paid generous pensions and benefits as our ageing population drifts into its own senescence. With demographic rates plummeting, we are morphing into one, big, giant retirement home. The CBC this morning mentioned that ‘no one is talking about debt and deficit’, no one seems to care, so politicians on both sides of the border also leave it well enough alone. Rather, more healthcare, more benefits, more wind turbines, well, whatever. I just heard of one 18 year old, whose grand goal in life is to become a firefighter, since, as he put it, they ‘only work seven days a month’, receive a very generous salary, and get lots of prestige; and, I might add, can work a second job, retire early, and have a grand old time. There are any number of young men – and women – like him. For what chump, besides those motivated by virtue and dignity, still wants to work in the private sector, with low wages and generally no benefits – to pay for all this? The virus of socialism – with the State taking over more and more of what we used to call the ‘economy’, even making up jobs to employ the otherwise unemployable – is growing like a virus, latent for a time, but now in full swing. We are living in a fantasyland, with people north and south of the border – witness the wackiness of Alexandria Ocasio Cortez and her trillion-dollar ‘Green Plan’- apparently thinking that money grows on the trees of some mysterious governmental farm, or drifting down from on high, to be gathered up like manna, or just printed off ad infinitum. There is no way to get this under control without some serious soul searching, blood letting and cost cutting – which includes severely curtailing the numbers and salaries of the legions of public employees, and a return to some semblance of economic reality. But don’t hold your breath. Even Doug Ford’s mention of allowing the number of teachers to drop through natural attrition has caused a near-apoplectic response. Ford may do what he might, but cosmetic cuts to make things look good will not do much good, as, like a gaseous red giant star, running out of fuel and energy at the end of its run, our bloated economy careens towards gravitational collapse under its own dead weight.